Bucculatrix ulmella Zeller, 1848. Linn. Ent. 3: 288. Leaf-miner: The mine is a short contorted gallery close to the midrib of a leaf, containing broken black frass (UKMoths). Egg at the upperside of the leaf, generally adjacent to the midrib. The mine is a short, angular corridor with much black frass and a relatively large larval chamber. The larvae soon leave their mines and start causing lower-surface window feeding Bladmineerders van Europa. The leaf-mine is also illustrated in British leafminers. Multiple mines can occur in the same leaf. Melissa Banthorpe found 14 mines in one leaf (see Facebook Group). Head brown, pronotum grey with black punctuation (Hering, 1957a) (Bladmineerders van Europa. The larva is illustrated in UKMoths and British leafminers. When pupating, in common with other Bucculatrix species, the larva creates a distinctive ribbed cocoon surrounded by a 'palisade' of vertical silken hairs (UKMoths). 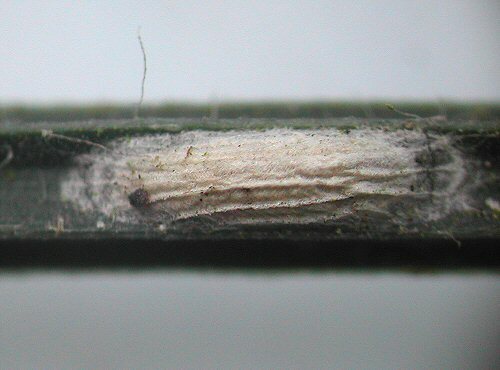 The pupa and cocoon are illustrated in British leafminers. Adult: The adult is illustrated in UKMoths by Rob Edmunds. The species is included in mothdissection.co.uk. Time of year - larvae: July, September - October (British leafminers). Distribution in Great Britain and Ireland: A fairly common species in England, including Lancashire (Greater Manchester and Littleborough) (UKMoths) and Hampshire (Fleet and Hayling Island) (British leafminers), Wales and Scotland, though like many of its genus probably overlooked (UKMoths); Bedfordshire, Breconshire, Caernarvonshire, Cambridgeshire, Derbyshire, Dorset, Durham, East Kent, East Norfolk, East Suffolk, Glamorgan, Haddington, Huntingdonshire, Isle of Wight, Leicestershire, Merionethshire, Middlesex, North Hampshire, North Northumberland, Shropshire, South Aberdeenshire, South Devon, South Hampshire, South Northumberland, South Wiltshire, Stafford, Surrey, Warwickshire, West Cornwall, West Gloucestershire, West Lancashire, West Norfolk, West Suffolk, Westmorland and Worcestershire (NBN Atlas). See also British leafminers distribution map. Also recorded from Ireland (UKMoths). See also Ireland's NBDC interactive map. Distribution elsewhere: Widespread in continental Europe including Austria, Belarus, Belgium, Croatia, Czech Republic, Danish mainland, Estonia, European Turkey, Finland, French mainland, Germany, Greek mainland, Hungary, Italian mainland, Latvia, Lithuania, Luxembourg, Macedonia, Norwegian mainland, Poland, Romania, Russia Central, East and Northwest, Sardinia, Sicily, Slovakia, Sweden, Switzerland, The Netherlands, Ukraine and Yugoslavia (Karsholt and van Nieukerken in Fauna Europaea).